How does a responsible society deal with waste streams in the most sustainable way – may it be plastic waste, electronics, organic material or tyres? 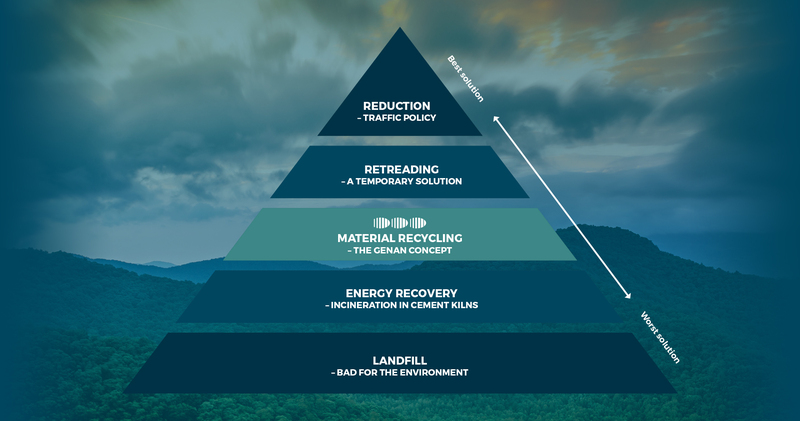 The most common way to illustrate this is through the waste hierarchy, which consists of 5 options ranging from the most to the least beneficial form of waste management. The best solution, reduction, is to avoid waste as much as possible by reducing consumption. In terms of tyres, this would imply a reduction of vehicle traffic. With the current global economic growth, especially outside the EU and the USA, this option does not seem very realistic in the near future. Second best would be to reuse, fully or partly, as we do with glass bottles. In terms of tyres, this is called retreading. – New rubber tread is laid on the inner body of the tyre, the casing; and in this way, the tyre gets a new life. Retreading can only be done a few times – depending on the quality of the casing – and in the end, the tyre will need to be scrapped when the casing is worn out. Third best choice, according to the waste hierarchy, is to separate and recycle the original materials. In terms of tyres, these materials are rubber, steel and textile. This separation process is what happens at a Genan plant, and the recycled material will be used to avoid production of new virgin rubber and steel. Fourth best choice is to use the material for energy recovery. This is not as sustainable as material recycling, as the product will be destroyed, and only a fraction of the energy originally invested in the production of the product, will be recovered. Tyres are widely used for energy recovery in cement kilns. This is called co-incineration. Landfilling is the worst choice possible. Nevertheless, this is still common practice in many parts of the world. Landfilling of tyres is a particularly bad solution, as they take up a lot of space, they are not biodegradable, and they make an excellent breeding ground for insects and vermin. In the EU, landfilling of tyres has been banned since 2003. The waste hierarchy is part of EU legislation, Directive 2008/98, and is also on the verge of being implemented as environmental legislation in other parts of the world. It is an obligation for EU member states to look for waste disposal solutions as high up in the hierarchy as possible. The scientific tool used to measure the impact of different waste disposal solutions is called Life Cycle Assessment.